A scientist at the University of California- Los Angeles, has discovered a genetic biological clock that accurately measures the biological age of tissues and organs in the body. Using a ntural process called DNA methylation and monitoring 353 biological markers, the clock can measure how each part of the body and its age is comparable to others. The scientist, UCLA geneticist and biostatistician Steven Horvath, Ph.D., noted for example that a woman's breast tissue, age faster than the rest of the body. DNA methylation is a genetic process that alters the expression of genes in cells as cells divide and differentiate from embryonic stem cells into specific tissues. As mentioned in the embedded video, DNA methylation is similar to a light dimmer switch where it can suppress a specific type of gene from expressing itself. Using 8,000 samples of 51 types of tissue, Dr. Horvath narrowed focused on 353 biomarkers that change with age and are present throughout the body. These markers measure the biological age of the target tissue rather than its chronological age. The next step in the research would be to find out if stopping or halting this clock can also stop aging. Everyone grows older, but scientists don't really understand why. Now a UCLA study has uncovered a biological clock embedded in our genomes that may shed light on why our bodies age and how we can slow the process. Published in the Oct. 21 edition of Genome Biology, the findings could offer valuable insights into cancer and stem cell research. "To fight aging, we first need an objective way of measuring it. 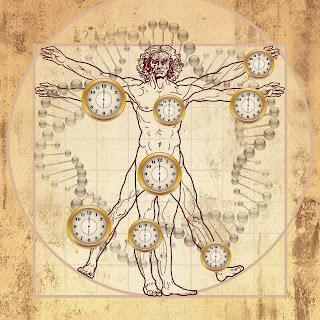 Pinpointing a set of biomarkers that keeps time throughout the body has been a four-year challenge," explained Steve Horvath, a professor of human genetics at the David Geffen School of Medicine at UCLA and of biostatistics at the UCLA Fielding School of Public Health. "My goal in inventing this clock is to help scientists improve their understanding of what speeds up and slows down the human aging process." Horvath tested the clock's effectiveness by comparing a tissue's biological age to its chronological age. When the clock repeatedly proved accurate, he was thrilled—and a little stunned. "It's surprising that one could develop a clock that reliably keeps time across the human anatomy," he admitted. "My approach really compared apples and oranges, or in this case, very different parts of the body: the brain, heart, lungs, liver, kidney and cartilage." "Healthy breast tissue is about two to three years older than the rest of a woman's body," said Horvath. "If a woman has breast cancer, the healthy tissue next to the tumor is an average of 12 years older than the rest of her body." Horvath next looked at pluripotent stem cells, adult cells that have been reprogrammed to an embryonic stem cell–like state, enabling them to form any type of cell in the body and continue dividing indefinitely.